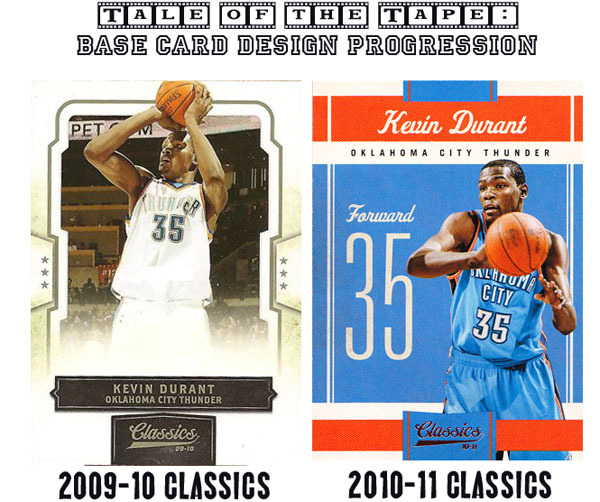 2010-11 Classics is the basketball card equivalent of a quality NBA 6th man. While it lacks the finishing touches and all-around game to crack the starting lineup, it does bring enough to the table to warrant plenty of playing time. Classics' card design is a big time improvement over last year's, the majority of autographs are on-card and the base set is extremely collectible thanks to numbered legends inclusions. The one weakness in Classics' game is that it lacks depth at the box break level, delivering far too many meaningless base cards and inserts. That being said, the product is definitely a step in right direction and gives Panini a solid foundation to build upon in coming years. The base card design is crisp, clean and classic. It delivers a distinct basketball feel that was missing from last season's offering. This marks a big step in the right direction for Panini, who struggles at times when it comes to delivering card design that captures the essence of the sport their covering. From legendary figures like Bill Russell and Larry Bird to current stars and rookies like Kevin Durant and John Wall, Classics features an impressive array of on-card autographs. The one area that could use an overahaul is the parallel system. They are nearly indistinguishable from the regular version of a card (unless it features a relic, auto or both). Variations are meant to blend in with regular cards, not parallels. The checklist features your typical Panini combo platter of legends, veterans and rookies. The base set is extremely strong and collectible, featuring an excellent mix of rookie autographs and numbered legend cards. The biggest problem with the checklist pertains to the set's aforementioned parallel problem in addition to a handful of out-of-place inserts. Having an insert set named "Dress Code" that features both non-relic and relic versions has always seemed odd to me. The three areas where Classics' value excels is when it comes to rookie autographs, legend/veteran autographs and the numbered base set legend cards - which bring set builders into the fold, which in turn boosts the value of the product as a whole. Each $90-$110 hobby box delivers a total of 18 packs, 4 hits and 2 numbered legends. The product's on-card autographs have sold extremely well in the secondary market for player's both big and small, new and old. The only complaint I have in terms of value pertains to the lack of depth outside the aforementioned cards, there are too many base cards, doubles and inserts per box. Improvements made to the card design and the crisp, on-card nature of the autographs made for an overall enjoyable box break experience. As I noted above, I wish the box was deeper than four hits and a pair of numbered legends base cards. There's something extremely painful about ripping the remainder of a box after pulling 4 hits in the first 8 packs. (4)2010 11 Panini Classics Basketball Factory Sealed Jumbo Rack Boxes-864 Cards! 2010-11 Panini Classics Factory Sealed NBA Hobby Box John Wall RC ? 2010 11 Panini Classics Basketball Jumbo Rack 20 Box Sealed CASE-4,320 Cards! 2010 11 Panini Classics Basketball Factory Sealed Blaster Box! Loaded!